I don't know about you, but I know that I can use all the positive energy that is available. 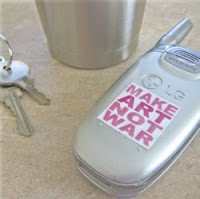 Bumpies are mini "bumper" stickers that are perfect for celle phones, iPods, MP3 Players, and other devices. Each one displays a positive thought or quote, such as Gandhi's quote "Where there is love there is life." These little cuties, that are printed on waterproof vinyl with removable adhesive, make great stocking stuffers. Unlike cell phone skins which are fitted to specific phone models, Bumpies fit on most cell phones, so you can give them as gifts without having to know the exact details about someone’s phone. I could go for reminding myself daily that "it is well with my soul."